The Idle No More movement, which has swept the country over the holidays, took most Canadians, including Prime Minister Stephen Harper and his Conservative government, by surprise. That is not to say that Canadians have never seen a native protest before, as most of us recall Oka, Burnt Church and Ipperwash. But most Canadians are not used to the kind of sustained, co-ordinated, national effort that we have seen in the last few weeks — at least not since 1969. 1969 was the last time the federal government put forward an assimilation plan for First Nations. Fierce native opposition defeated it, and it looks like Harper’s aggressive legislative assimilation plan will be met with even fiercer resistance. In order to understand what this movement is about, it is necessary to understand how our history is connected to the present-day situation of First Nations. While a great many injustices were inflicted upon the indigenous peoples in the name of colonization, indigenous peoples were never “conquered.” The creation of Canada was only possible through the negotiation of treaties between the Crown and indigenous nations. While the wording of the treaties varies from the peace and friendship treaties in the east to the numbered treaties in the west, most are based on the core treaty promise that we would all live together peacefully and share the wealth of this land. The problem is that only one treaty partner has seen any prosperity. The failure of Canada to share the lands and resources as promised in the treaties has placed First Nations at the bottom of all socio-economic indicators — health, lifespan, education levels and employment opportunities. While indigenous lands and resources are used to subsidize the wealth and prosperity of Canada as a state and the high-quality programs and services enjoyed by Canadians, First Nations have been subjected to purposeful, chronic underfunding of all their basic human services like water, sanitation, housing, and education. This has led to the many First Nations being subjected to multiple, overlapping crises like the housing crisis in Attawapiskat, the water crisis in Kashechewan and the suicide crisis in Pikangikum. Part of the problem is that federal “Indian” policy still has, as its main objective, to get rid of the “Indian problem.” Instead of working toward the stated mandate of Indian Affairs “to improve the social well-being and economic prosperity of First Nations,” Harper is trying, through an aggressive legislative agenda, to do what the White Paper failed to do — get rid of the Indian problem once and for all. The Conservatives don’t even deny it — in fact Harper’s speech last January at the Crown-First Nation Gathering focused on the unlocking of First Nations lands and the integration of First Nations into Canadian society for the “maximized benefit” of all Canadians. This suite of approximately 14 pieces of legislation was drafted, introduced and debated without First Nation consent. Idle No More is a co-ordinated, strategic movement, not led by any elected politician, national chief or paid executive director. It is a movement originally led by indigenous women and has been joined by grassroots First Nations leaders, Canadians, and now the world. It originally started as a way to oppose Bill C-45, the omnibus legislation impacting water rights and land rights under the Indian Act; it grew to include all the legislation and the corresponding funding cuts to First Nations political organizations meant to silence our advocacy voice. Our activities include a slow escalation from letters to MPs and ministers, to teach-ins, marches and flash mobs, to rallies, protests and blockades. The concept was to give Canada every opportunity to come to the table in a meaningful way and address these long-outstanding issues, and escalation would only occur if Canada continued to ignore our voices. Sadly, Prime Minister Harper has decided to ignore the call for dialogue just as he has ignored the hunger-striking Attawapiskat Chief Theresa Spence. Although Idle No More began before Chief Spence’s hunger strike, and will continue after, her strike is symbolic of what is happening to First Nations in Canada. For every day that Spence does not eat, she is slowly dying, and that is exactly what is happening to First Nations, who have life spans up to 20 years shorter than average Canadians. 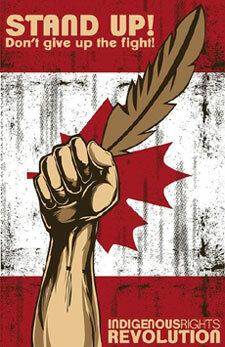 Idle No More has a similar demand in that there is a need for Canada to negotiate the sharing of our lands and resources, but the government must display good faith first by withdrawing the legislation and restoring the funding to our communities. Something must be done to address the immediate crisis faced by the grassroots in this movement. I am optimistic about the power of our peoples and know that in the end, we will be successful in getting this treaty relationship back on track. However, I am less confident about the Conservative government’s willingness to sit down and work this out peacefully any time soon. Thus, I fully expect that this movement will continue to expand and increase in intensity. Canada has not yet seen everything this movement has to offer. It will continue to grow as we educate Canadians about the facts of our lived reality and the many ways in which we can all live here peacefully and share the wealth. After all, First Nations, with our constitutionally protected aboriginal and treaty rights, are Canadians’ last best hope to protect the lands, waters, plants and animals from complete destruction — which doesn’t just benefit our children, but the children of all Canadians. Pamela Palmater is chair in Indigenous Governance at Ryerson University and an indigenous activist with Idle No More.